Department of Computer Science, Houghton College, Houghton, New York, USA. Received 11 December 2009; revised 14 December 2009; accepted 15 December 2009.
its genetic materials from birds, humans, and pigs. the cell membrane and HA2 mediates membrane fusion. lated and α2-6 sialylated glycan receptors, respectively. species to make new influenza viruses. of the influenza viruses is apparent. 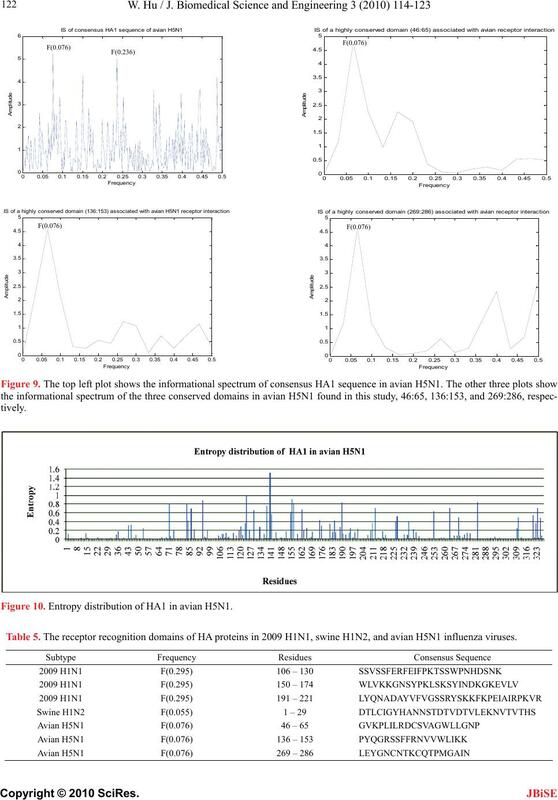 sated by the presence of Lys145 in HA of 2009 H1N1. coded in the peaks of the informational spectrum. typical examples of these highly conserved regions. for new drugs and infection control. Table 1. Characteristic IS frequencies of HA proteins in 2009 H1N1, swine H1N1/H1N2, avian H5N1, and seasonal human H1N1. Table 2. 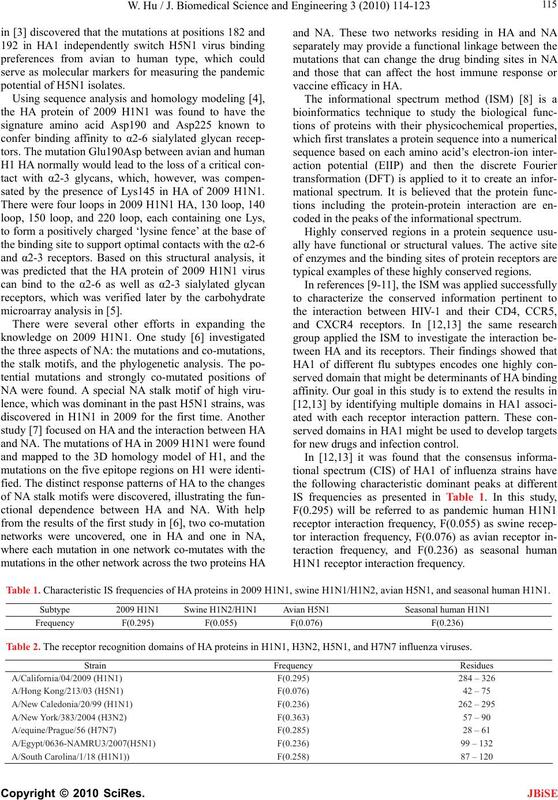 The receptor recognition domains of HA proteins in H1N1, H3N2, H5N1, and H7N7 influenza viruses. found in , which is also a part of Figure 5 in . was a reproduced figure in . order or randomness associated with a random variable. positions 187, 191 and 192 are a part of the 190 helix. loop and 220 loop, respectively . technique that can be utilized to analyze protein sequences. ergy of the valence electrons in the amino acid (Table 4). is transformed into the frequency domain using DFT. 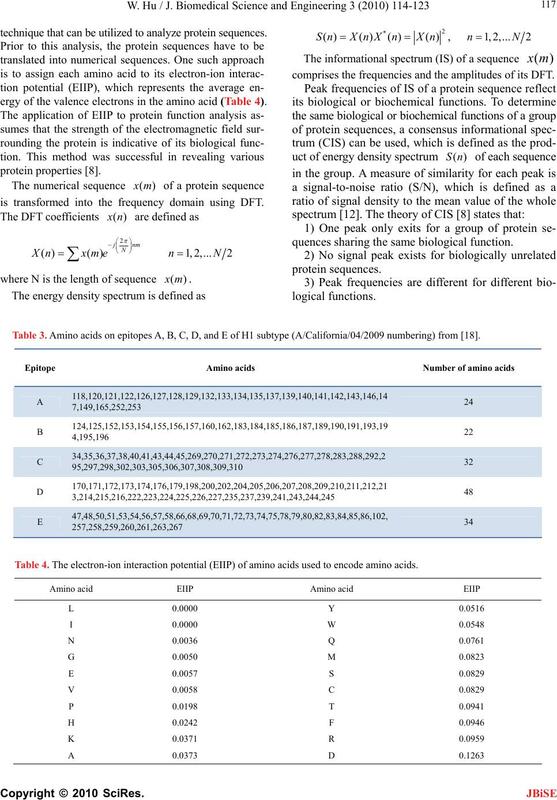 comprises the frequencies and the amplitudes of its DFT. quences sharing the same biological function. Table 3. Amino acids on epitopes A, B, C, D, and E of H1 subtype (A/California/04/2009 numbering) from . Table 4. The electron-ion interaction potential (EIIP) of amino acids used to encode amino acids. HA1 of different influenza subtypes. H1N2 in orange (PDB code: 1RU7). significant roles in the binding affinity for 2009 H1N1. gested that the domain 1:29 was well conserved. Figure 5. 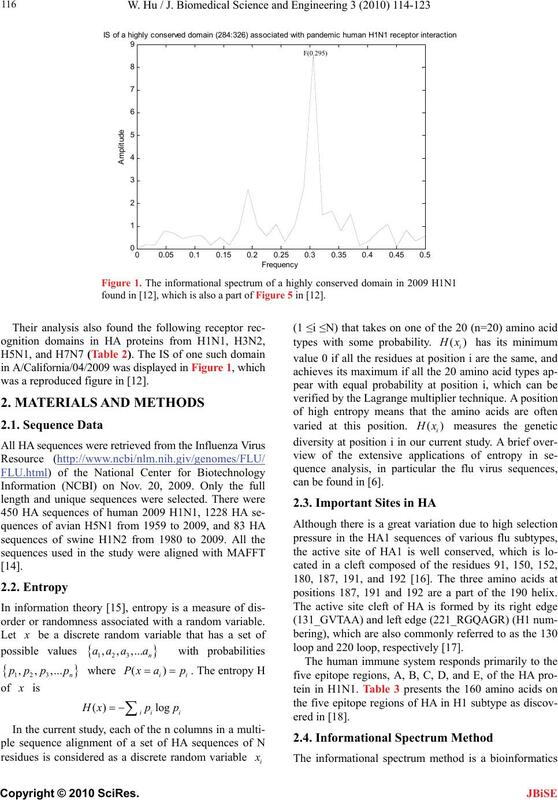 Entropy distribution of HA1 in 2009 H1N1. informational spectrum of one conserved domain 1:29 in swine H1N2 found in this study. Figure 7. Entropy distribution of HA1 in swine H1N2. 269:286 in blue (PDB code: 2IBX). 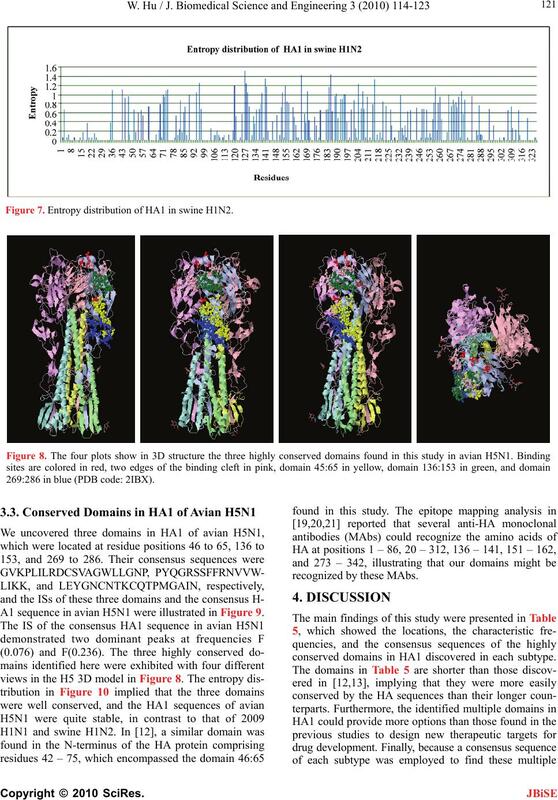 A1 sequence in avian H5N1 were illustrated in Figure 9.
conserved domains in HA1 discovered in each subtype. Figure 10. 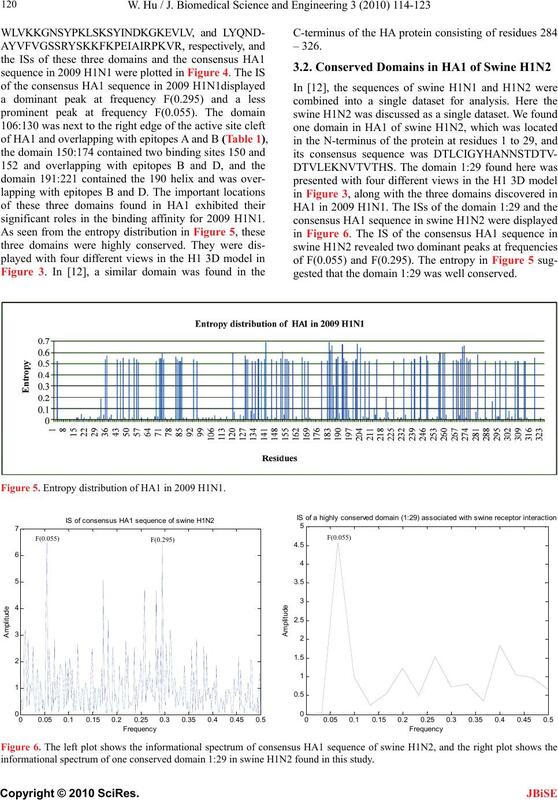 Entropy distribution of HA1 in avian H5N1. Table 5. 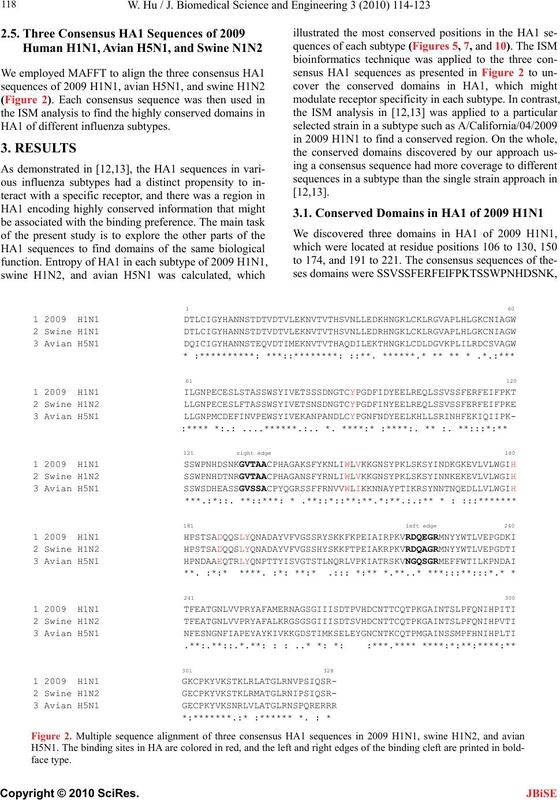 The receptor recognition domains of HA proteins in 2009 H1N1, swine H1N2, and avian H5N1 influenza viruses. new drugs and treatment of influenza infection. the same time decreasing that at frequency F(0.055). ceptor binding phenotype of influenza A (H5) viruses. Shinya, Y., Yasuo, S., Takashi, S., Mai, Q.L., Chairul, A.
enza virus. Nature Biotechnology, 27, 510-513. Science and Engineering, 2(7), 550-558.
medical Science and Engineering, 3, 1–12. gp120 determining binding to T4 cell surface protein. 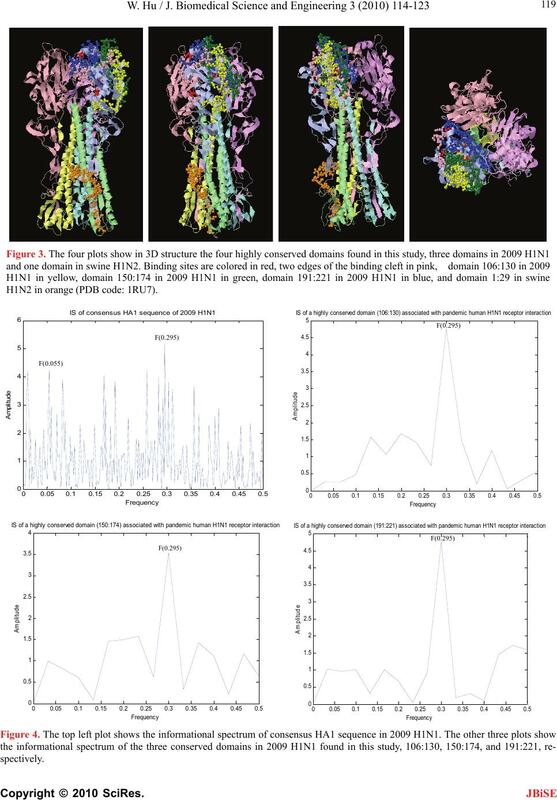 Cancer Biochem Biophys, 10, 91-106.
modulate swine H1N1 interactions with human receptor. BMC Structural Biology, 9, 62.
therapy and infection control. BMC Struct Biol, 7, 9-21.
sequence alignment. Nucleic Acids Res, 33, 511-518.
learning algorithms. Cambridge University Press. KováccaronOVá, A., Ruttkay-Nedecký, G., HaverlíK, I.
tinins. 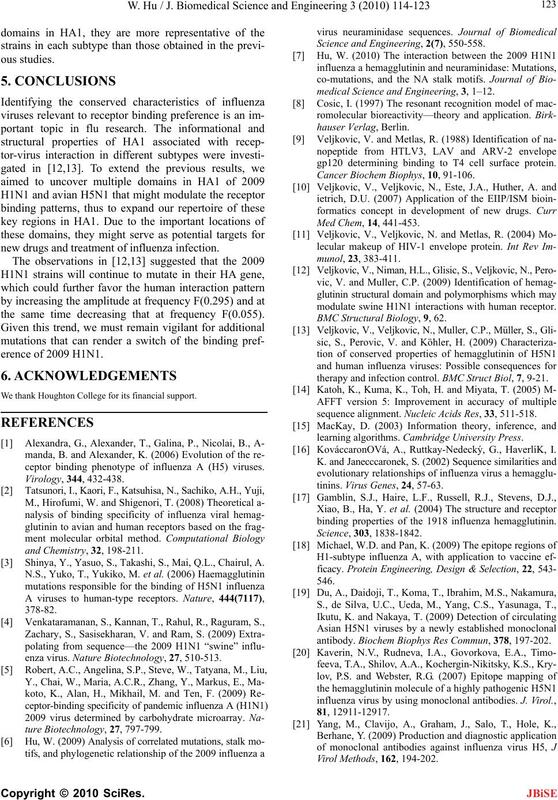 Virus Genes, 24, 57-63.
binding properties of the 1918 influenza hemagglutinin. antibody. Biochem Biophys Res Commun, 378, 197-202.